Owen's Electric Motor Rewinds Gympie - WEG Generators. 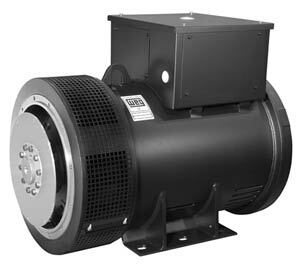 At Owens Electric Motor Rewinds, we recommend and supply WEG Generators. WEG's Quality System is certified in accordance with the ISO 9001/14001 standard requirements. The Quality System is audited and certified by the Bureau Veritas Quality Institute. To comply with the most demanding markets, WEG synchronous generators are certified by worldwide institutions such as C.S.A. (CANADIAN STANDARDS ASSOCIATION), C.E. (EUROPEAN COMMUNITY) AND UL (UNDERWRITES LABORATORIES). WEG synchronous generators for naval applications can be supplied if requested with certificates from classifying entities such as Lloyds, Bureau Veritas, ABS, Germanischer Lloyd, DNV and others. 1) The three-phase generators with 12 leads can operate on 190/208/220/240/380/440/480V in 60Hz and 190/208/220/230/380/400V in 50Hz. 2) Three-phase generators with 12 leads can be reconnected to supply single-phase voltages from 110 to 480V. Additional protections are recommended if the generator is to be used in environments where abrasive dust may enter through ventilation. Although the generator coils are protected against abrasive environments, severe conditions may require additional protection such as : deflectors, closed cabinets, filters or other suitable protection. Contact WEG for recommendations. Generators are manufactured with an additional protection over all windings (main stator/rotor and excitation) for marine environments or naval applications. In all outdoor applications the generators must be protected and still maintain adequate openings for ventilation. This protection must be designed in such a way as to prevent the generator of being directly exposed to rain, snow or dust. The use of space heaters is recommended depending on the location and application. Contact WEG for recommendations about required protections. The generator operates at rated power levels during unlimited periods of time with up to 10% overloading during 1 hour every 12 hours or 2 hours every 24 hours without causing any damage to its insulation system. The Continuous or Prime Duty is mostly applied where no other source of power is available such as: renal units, irrigation units, refrigeration, co-generation, peak shaving applications etc. temperature rise for continuous duty are typically 125°C, 105°C or 80°C over 40°C ambient. The generator operates as a backup, with variable loads during emergency situations in locations where the main source of power is off. In this duty cycle the generator will not allow overloads and will operate with variable loads up to its maximum rated power level for the stand-by duty at 40°C ambient. 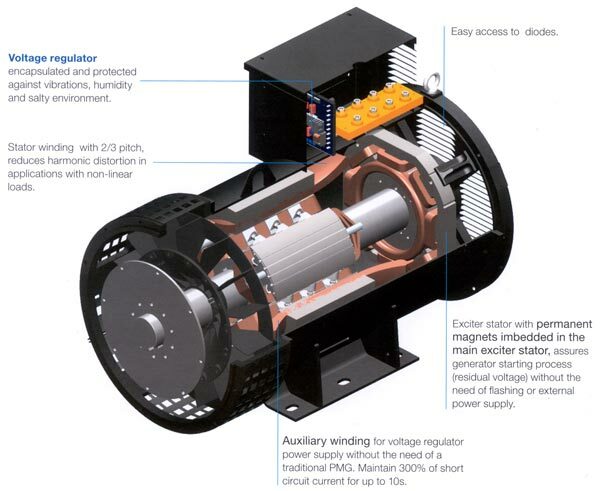 The maximum allowed winding temperature is 150°C (per Nema MG-1 and IEC 34 standards), however under these conditions the generator's expected life will be reduced 2 to 6 times. The usage of the generator in stand-by duties is limited to 500 hours per year. This condition is similar to the 150°C temperature rise over 40°C ambient described previously. However the maximum ambient temperature is now 27°C. In this application the generator can supply higher power levels at temperature rise of 163°C. The main application remains in emergency as a back-up for the main source as well as limited to 300 hours per year of operation. WEG warranty for continuous duty generators covers manufacturing or material defects for a period of 12 months starting from the invoice issue date (shipping), or 12 months starting from the WEG distributor or retailer's invoice issue date, limited to 18 months from the date of manufacturing. For stand by duty the warranty is limited to 24 months from invoice issue date (shipping) or 30 months from the manufacturing date. Click here for more information on WEG generators. Whatever the generator need, contact Jeff at Owen's Electric Motor Rewinds on 07 5482 7171.